Objective: The mode of delivery in breech presentation (BP) is controversial. Several studies have reported the advantages and disadvantages of delivery mode in BP. The aim of this study was to compare the Apgar scores in BPs between vaginal and cesarean delivery. Materials and Methods: A retrospective study was conducted at Dr. Zainoel Abidin General Hospital from January 2010 to December 2012. Data on the mode of delivery and Apgar scores at 1 and 5 min for infants with a BP were extracted from the medical records. Logistic regression was employed to assess the correlation between mode of delivery and Apgar scores. In addition, a meta-analysis was conducted to summarize findings from other regions. Results: A total of 205 (3.9%) BPs among 5252 deliveries between January 2010 and December 2012 were analyzed for this study. There were 26% (52 cases) vaginal and 74% (153 cases) cesarean deliveries. The mode of delivery for BP had a significant association with Apgar score at 1 min (odds ratio [OR] 95% confidence interval [CI] = 6.462 [2.476–16.870], P = 0.0001) and 5 min (OR 95% CI =7.727 [1.416–42.175], P = 0.018). Our meta-analysis showed that the delivery mode had a significant association with Apgar score in BP (OR: 3.69; 95% CI: 2.18–6.26, P = 0.0001). Conclusions: There was a significant association between Apgar scores in BPs and mode of delivery. Our results suggest better outcomes for cesarean than vaginal delivery in BPs. Breech presentation (BP) is a significant obstetric event associated with increases in perinatal morbidity and mortality . BP complicates 3%–4% of all term deliveries and a higher proportion of preterm deliveries , ranging from 20% to 30% in preterm and 2%–9% in term pregnancies ,,. The relatively lower incidence at term is probably due to spontaneous correction . Studies reported that BP is an independent risk factor for neonatal morbidity and mortality ,. The incidence of neonatal morbidity associated with BP in one study was 3.6% . However, the incidence varied from 0.37%  to 10.4% . BP is also associated with asphyxia, birth trauma , acidemia at birth, and neurological disorders ,. Birth morbidity in BP may be caused by underlying conditions such as congenital anomalies  or intrauterine growth restriction or from perinatal complications during labor and delivery ,. The morbidity and mortality of BP are influenced by the mode of delivery (vaginal or cesarean). There are advantages and disadvantages for each delivery mode in BP. The advantages of vaginal labor are minimized blood loss, minimized surgical stress, quicker recovery, and hemodynamic stability while the advantages of cesarean section are predictability, planned delivery, timed delivery, and immediate availability of all personnel. The disadvantages of vaginal labor are unpredictable timing and a potentially prolonged, painful, and stressful labor. The disadvantages of cesarean section are increased surgical stress, higher blood loss, longer recovery, and higher potential for postoperative complications . In one study of patients opinions, vaginal labor was considered better because it caused less pain and suffering while lack of contractions and pain were considered advantages of cesarean section . Asphyxia has an important role and has been associated with a variety of infant morbidities such as hypoxic-ischemic encephalopathy , cerebral palsy, mental retardation , cardiogenic shock , and vasoparalysis . The Apgar score is widely used as a diagnostic test for asphyxia . However, the mode of delivery is important in the evaluation of neonatal asphyxia. Therefore, this study aimed to investigate the association of Apgar scores in infants with BP with the mode of delivery (vaginal labor vs. cesarean section). The results of this study might be important in establishing guidelines for the management of BP. This study was a retrospective study conducted at Dr. Zainoel Abidin General Hospital from January 2013 to May 2013. The study was conducted in accordance with the Declaration of Helsinki and was approved by the local ethics committee of the institute. Informed written consent was waived because the study was a retrospective data analysis. The total population was all pregnant women (5252 patients – updated January 9, 2013) who delivered at this hospital from January 2010 to December 2012. A total sampling method was used in the study. The sample in this study included 205 BPs. Eligibilitycriteria consisted of predefined inclusion and exclusion criteria. Inclusion criteria for this study were (1) pregnant women who had a BP and (2) were over 18-year-old. The exclusion criteria were (1) gestational age was <37 weeks or >40 weeks, (2) birth weight estimation was <2500 g or >3800 g, (3) nonanomalous newborn, (4) mother with placenta previa, (5) mother with a narrow pelvis, defined as a distance between the pubic bone and the promontory of <10 cm , (6) cephalopelvic disproportion, defined when the pelvis was not large enough to accommodate passage of the fetus , (7) uterine rupture, (8) cervical dystocia, (9) uterine dysfunction, and (10) soft tissue dystocia. Data extracted from the medical records included the mode of delivery in BP and Apgar scores at 1 and 5 min. The procedures in this study were as follows: (1) determine the population and sample size, (2) provide the explanations and record baseline data including personal, demographic, and clinical information, (3) collect data, (4) analyze the data using SPSS descriptively and analytically to determine the associations between variables. The Apgar score is conventionally assigned after birth and recorded in the newborn's chart. The Apgar score consists of the total points assigned for five objective signs in the newborn  and is used to evaluate newborns at 1 and 5 min after birth . The Apgar score in the study was used to evaluate newborns with BPs. The measurement results for this variable were divided into Apgar scores <7 and ≥7. An ordinal scale was used to assess this variable. The modes of delivery, vaginal, and cesarean were compared in infants with BP. A nominal scale was used to assess this variable. Data on the association of Apgar scores of infants with BP with the mode of delivery were analyzed using bivariate analysis. Odds ratios (ORs) and 95% confidence intervals (95% CIs) were analyzed using a double logistic regression test with SPSS software (SPSS, Version 15, Chicago, USA). A P<0.05 was considered statistically significant. A meta-analysis was conducted to assess the association between Apgar scores of infants with BPs and mode of delivery. Pubmed and Embase were searched for studies on the association between Apgar scores of infants with a BP and mode of delivery. The following information was extracted from each study: (1) name of the first author; (2) year of publication; (3) country of origin; (4) sample sizes of cases and controls, and (5) sample size of each delivery mode. The correlation between Apgar scores and the mode of delivery was estimated by calculating pooled ORs and 95% CIs. The significance of pooled ORs was determined by Z-tests (P < 0.05 was considered statistically significant). A Q-test was performed to evaluate whether heterogeneity existed. A random effects model was used to calculate the OR 95% CI if heterogeneity existed (P < 0.10). A fixed effects model was used to calculate the OR 95% CI if no heterogeneity existed. Publication bias was assessed using Egger's test (P < 0.05 was considered statistically significant). Comprehensive meta analysis (CMA), version 2.0, Biostat Inc, USA, was used to analyzed the data. During this period, there were 224 (4.26%) BPs among a total of 5252 deliveries between January 2010 and December 2012. Of these, 19 patients were excluded because the gestational age was <37 weeks or >40 weeks (seven patients), the birth weight was estimated to be <2500 g or >3800 g (five patients), or the mother had a narrow pelvis and/or cephalopelvic disproportion (seven patients). Finally, 205 patients (3.9% of the total 5252 deliveries) with BP were included in the study. A flow chart of the study is shown in [Figure 1]. Vaginal and cesarean delivery rates were 26% (52 cases) and 74% (153 cases), respectively. Apgar scores ≥7 at 1 min were recorded after 24 vaginal and 141 cesarean deliveries and at 5 min in 35 vaginal and 151 cesarean deliveries. Apgar scores <7 at 1 min were recorded after 28 vaginal and 12 cesarean deliveries and at 5 min after 17 vaginal and 2 cesarean deliveries. The double logistic regression test showed that the mode of delivery in BP had a significant association with Apgar scores at 1 min (OR 95% CI = 6.462 [2.476–16.870], P = 0.0001) and 5 min (OR 95% CI = 7.727 [1.416–42.175], P = 0.0180). Our analysis showed that infants with a BP had better Apgar scores after cesarean than vaginal delivery. [Table 1] shows the association of Apgar scores in BP with the mode of delivery. In the meta-analysis, a total of 22040 vaginal and 22146 cesarean deliveries with BPs were identified. Overall, the results showed a significant association between Apgar scores in BP and the mode of delivery. The mode of delivery was significantly associated with the Apgar score in BPs (OR 95% CI = 3.69 [2.18–6.26], P = 0.0001). A forest plot of the correlation between Apgar scores in BPs and the mode of delivery is shown in [Figure 2]. A summary of the ORs and 95% CIs regarding the correlation between Apgar scores in BP and mode of delivery in the studies in the meta-analysis is shown in [Table 2]. Evidence for heterogeneity (P = 0.0001) between studies was found in all multiplicative. Therefore, the data in this study were assessed using a random effects model. Using Egger's test, no publication bias could be detected (P = 0.648). BP is an important cause of deformities . BP is associated with asphyxia, which has an important role in the development of several infant morbidities including hypoxic-ischemic encephalopathy , cerebral palsy, mental retardation , cardiogenic shock , and vasoparalysis . The Apgar score is widely used to detect asphyxia in newborns . The Apgar score in infants with BP is strongly influenced by the mode of delivery as shown in this study. This is the first study in Indonesia, on the correlation between Apgar scores in infants with a BP and the mode of delivery. The first study on this subject was conducted by Main et al . in the United States (US). The concept of this study was similar to that of several previous studies on Apgar scores in BPs and delivery mode ,,,,,,,,,. The percentage of BP in our study was low at around 4%, similar to the rates of 2.9% in the United Kingdom (UK) , 2.9% in Norway , 2.2% in Switzerland , 30% in Canada , 3.4 % in Sweden , 3.1% in California , 8.2% in the Netherlands , and 3.1 % in France and Belgium . However, the delivery mode varied widely in these studies, with respective vaginal and cesarean rates of 27.9% and 72.1% in the UK , 52.7% and 47.3% in Norway , 54.6% and 45.4% in Switzerland , 13.6% and 86.4% in Canada , 57.4% and 42.6% in Sweden , 37.1% and 62.9% in France , 4.9% and 95.1% in California,, 59.0% and 41.0% in the Netherlands , and 31.2% and 68.8% in France and Belgium . In four studies ,,,, vaginal deliveries were more common while in the other five studies ,,,,, cesarean section was used more often for BPs. In our study, the cesarean section was more dominant with a rate of 74% (153 cases). Birth asphyxia is defined as a reduction of oxygen delivery and an accumulation of carbon dioxide owing to cessation of blood supply to the fetus . The Apgar score  and it is widely used as an index of the severity of intrapartum asphyxia . In the vaginal delivery group, 28 patients had Apgar scores <7 and 24 had scores ≥7 at 1 min, and 17 patients with Apgar had scores <7 and 35 had Apgar scores ≥7 at 5 min. For the cesarean group, 12 patients had Apgar scores <7 and 141 had Apgar scores ≥7 at 1 min while two patients had Apgar scores <7 and 151 had scores ≥7 at 5 min. In our study, mode of delivery in BP had a statistically significant association with Apgar score at 1 min (OR 95% CI = 6.462 [2.476–16.870], P = 0.0001) and 5 min (OR 95% CI = 7.727 [1.416–42.175], P = 0.0180). The risk of asphyxia (evaluated from the Apgar score) was about six- to eight-fold higher in the vaginal delivery than the caesarean delivery group. As of July 15, 2016, 10 studies had evaluated the correlation between delivery mode in BP and asphyxia with the Apgar score. They showed different results but had the same basic conclusion. Eight studies showed that the mode of delivery had a significant association with infant asphyxia in the US (P = 0.0010) , the UK (OR 95% CI = 1.52 [1.04–2.22] P = 0.0300) , Norway (OR 95% CI = 16.39 [5.93 – 45.25], P = 0.0001) , Sweden (P = 0.0020) , France (OR 95% CI = 2.18 [1.50–3.18] P = 0.0001) , California (OR 95% CI = 1.50 [1.30–1.60] P = 0.0001) , the Netherlands (OR 95% CI = 4.83 [4.13–5.65] P = 0.0001) , and France and Belgium (OR 95% CI = 3.17 [1.92–5.25] P = 0.0001) . The Swiss (OR 95% CI = 2.52 [0.51–12.56] P = 0.3000)  and Canadian studies (OR 95% CI = 1.70 [0.75–3.93] P = 0.2000)  found no significant correlation between mode of delivery and infant asphyxia. These different results could not be explained properly. A comparison of the results of this study with several other studies is described in [Table 2]. The management of BP at term can include external cephalic version, planned caesarean section, and a trial of vaginal delivery. Although several studies have recommended a trial of vaginal labor, this method is not supported by neonatal outcomes ,,. There are not enough data from this retrospective study alone to determine the best management for BP. Therefore, a meta-analysis can help determine the actual association. Our previous meta analysis had shown the actual association regarding the role of several genes in some diseases ,,. In this study, we combined data from several other studies on the association between Apgar scores in BP and the mode of delivery. We calculated the combined ORs and 95% CIs of eight studies with the results of our study. We found that the delivery mode had a significant association with Apgar scores in BP (OR 95% CI = 3.69 [2.18–6.26], P = 0.0001). 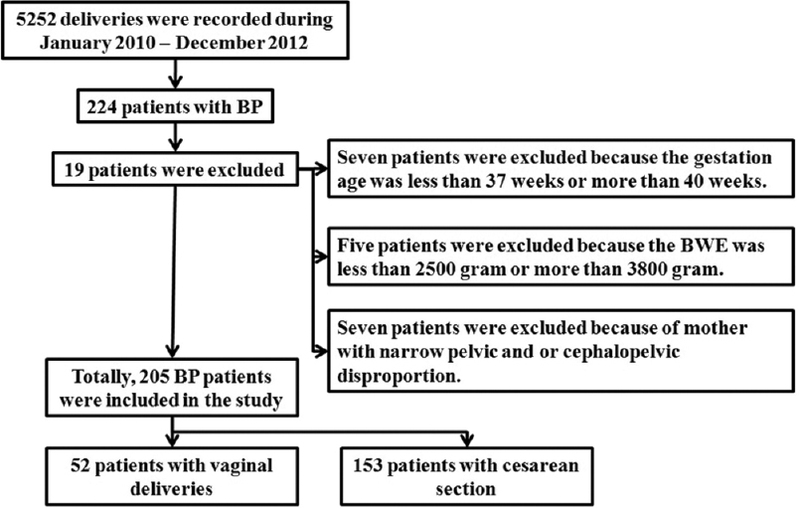 Cesarean section was better than vaginal delivery for the management of BP. A forest plot of the correlation between Apgar scores in BP and mode of delivery is shown in [Figure 2]. These results are supported by a meta-analysis conducted by Gifford et al . on infant outcomes after breech delivery. They showed that a trial of vaginal delivery was associated with an increased risk of neonatal injury and/or death. The meta-analysis of Berhan and Haileamlak  on perinatal mortality and morbidity in planned vaginal breech delivery found that the relative risk of perinatal mortality and morbidity was about two- to five-fold higher in the planned vaginal than in the planned caesarean delivery group. A meta-analysis by Mozurkewich and Hutton  showed that fetal or neonatal death and 5-min Apgar scores <7 were more frequent in the trial of labor group. Although the resuwed that the cesarean section group had the better outcomes in BP, it is not presently possible to give recommendations for the management of BP. Therefore, obstetrics and gynecology organizations are expected to review neonalts of this study shotal outcomes in BP to determine gold standard recommendations for the management of BP. There were several limitations in the study. First, some data on factors associated with BP were not included, such as parity, maternal age, maternal body mass index, type of BP, birth trauma, and uterine scarring. Second, false negative results could have occurred in this study because of the small sample size. Therefore, further studies with larger sample sizes are needed to determine the actual association. Third, the results of this study did not fully reflect the Aceh population because samples were recruited only from Dr. Zainoel Abidin Teaching Hospital. Our study found that mode of delivery in BP had a significant association with the risk of infant asphyxia evaluated at 1 and 5 min. Our meta-analysis showed that the delivery mode had a significant association with Apgar scores in BP. Further studies using larger and prevalent sample sizes and including factors that play a role in BP and asphyxia are needed to correlate the mode of delivery in BP with the risk of asphyxia in the Aceh population. Winn HN, Hobbins JC. Clinical Maternal – Fetal Medicine. New York: The Parthenon Publishing Group Inc.; 2000. Mukherjee GG, Chakravarty S, Pal B, Mukherjee B. Current Obstetrics and Gynecology. New Delhi: Jaypee Brothers Medical Publishers (p) Ltd.; 2007. Daftary SN, Chakravarti S, Pai MV, Kushtagi V. Holland and Brews Manual of Obstetrics. 4th ed. Amsterdam: Elsevier, Saunders, Mosby, Churchill; 2015. Kurjak A, Chervenak FA. Textbook of Perinatal Medicine. 2nd ed., Vol. 1. London: Informa UK Ltd.; 2006. Scheer K, Nubar J. Variation of fetal presentation with gestational age. Am J Obstet Gynecol 1976;125:269-70. Schutte MF, van Hemel OJ, van de Berg C, van de Pol A. Perinatal mortality in breech presentations as compared to vertex presentations in singleton pregnancies: An analysis based upon 57819 computer-registered pregnancies in The Netherlands. Eur J Obstet Gynecol Reprod Biol 1985;19:391-400. Bierman-van Eendenburg ME, Jurgens-van der Zee AD, Olinga AA, Huisjes HH, Touwen BC. Predictive value of neonatal neurological examination: A follow-up study at 18 months. Dev Med Child Neurol 1981;23:296-305. Herbst A, Thorngren-Jerneck K. Mode of delivery in breech presentation at term: Increased neonatal morbidity with vaginal delivery. Acta Obstet Gynecol Scand 2001;80:731-7. Rietberg CC, Elferink-Stinkens PM, Brand R, van Loon AJ, Van Hemel OJ, Visser GH. Term breech presentation in The Netherlands from 1995 to 1999: Mortality and morbidity in relation to the mode of delivery of 33824 infants. BJOG 2003;110:604-9. De Crespigny LJ, Pepperell RJ. Perinatal mortality and morbidity in breech presentation. Obstet Gynecol 1979;53:141-5. Whyte H, Hannah ME, Saigal S, Hannah WJ, Hewson S, Amankwah K, et al. Outcomes of children at 2 years after planned cesarean birth versus planned vaginal birth for breech presentation at term: The International Randomized Term Breech Trial. Am J Obstet Gynecol 2004;191:864-71. Mostello D, Chang JJ, Bai F, Wang J, Guild C, Stamps K, et al. Breech presentation at delivery: A marker for congenital anomaly? J Perinatol 2014;34:11-5. Teteris NJ, Botschner AW, Ullery JC, Essig GF. Fetal heart rate during breech delivery. Am J Obstet Gynecol 1970;107:762-6. Hannah ME, Hannah WJ, Hewson SA, Hodnett ED, Saigal S, Willan AR. Planned caesarean section versus planned vaginal birth for breech presentation at term: A randomised multicentre trial. Term Breech Trial Collaborative Group. Lancet 2000;356:1375-83. Gambling DR, Douglas MJ, McKay RS. Obstetrics Anesthesia and Uncommon Disorders. New York: Cambridge University Press; 2008. Osis MJ, Pádua KS, Duarte GA, Souza TR, Faúndes A. The opinion of Brazilian women regarding vaginal labor and cesarean section. Int J Gynaecol Obstet 2001;75 Suppl 1:S59-66. Martín-Ancel A, García-Alix A, Pascual-Salcedo D, Cabañas F, Valcarce M, Quero J. Interleukin-6 in the cerebrospinal fluid after perinatal asphyxia is related to early and late neurological manifestations. Pediatrics 1997;100:789-94. Paneth N, Stark RI. Cerebral palsy and mental retardation in relation to indicators of perinatal asphyxia. An epidemiologic overview. Am J Obstet Gynecol 1983;147:960-6. Behrman RE, Cabal LA, Devaskar U, Siassi B, Hodgman JE, Emmanouilides G. Cardiogenic shock associated with perinatal asphyxia in preterm infants. J Pediatr 1980;96:705-10. Pryds O, Greisen G, Lou H, Friis-Hansen B. Vasoparalysis associated with brain damage in asphyxiated term infants. J Pediatr 1990;117(1 Pt 1):119-25. Thorngren-Jerneck K, Herbst A. Low 5-minute Apgar score: A population-based register study of 1 million term births. Obstet Gynecol 2001;98:65-70. Cloherty JP, Elchenwald EC, Stark AR. Manual of Neonatal Care. 6th ed. Philadelphia: Lippincott Williams and Wilkins; 2008. Ricci SS, Kyle T. Maternity and Pediatric Nursing. Philadelphia: Lippincott Williams and Wilkins; 2009. Graham JM Jr., Sanchez-Lara PA. Smith's Recognizable Patterns of Human Deformation. 4th ed. Philadelphia: Elsevier Inc.; 2016. Main DM, Main EK, Maurer MM. Cesarean section versus vaginal delivery for the breech fetus weighing less than 1,500 grams. Am J Obstet Gynecol 1983;146:580-4. Thorpe-Beeston JG, Banfield PJ, Saunders NJ. Outcome of breech delivery at term. BMJ 1992;305:746-7. Albrechtsen S, Rasmussen S, Reigstad H, Markestad T, Irgens LM, Dalaker K. Evaluation of a protocol for selecting fetuses in breech presentation for vaginal delivery or cesarean section. Am J Obstet Gynecol 1997;177:586-92. Irion O, Almagbaly PH, Morabia A. Planned vaginal delivery versus elective caesarean section: A study of 705 singleton term breech presentation. Int J Obstet Gynaecol 1998;105:710-7. Golfier F, Vaudoyer F, Ecochard R, Champion F, Audra P, Raudrant D. Planned vaginal delivery versus elective caesarean section in singleton term breech presentation: A study of 1116 cases. Eur J Obstet Gynecol Reprod Biol 2001;98:186-92. Gilbert WM, Hicks SM, Boe NM, Danielsen B. Vaginal versus cesarean delivery for breech presentation in California: A population-based study. Obstet Gynecol 2003;102(5 Pt 1):911-7. Goffinet F, Carayol M, Foidart JM, Alexander S, Uzan S, Subtil D, et al. Is planned vaginal delivery for breech presentation at term still an option? Results of an observational prospective survey in France and Belgium. Am J Obstet Gynecol 2006;194:1002-11. Attard-Montalto S, Saha V. Paediatrics: A Core Text with Self Assessment. 2nd ed. Philadelphia: Elsevier Inc.; 2006. American Academy of Pediatrics; Committee on Fetus and Newborn; American College of Obstetricians and Gynecologists; Committee on Obstetric Practice. The Apgar score. Adv Neonatal Care 2006;6:220-3. Nelson KB, Leviton A. How much of neonatal encephalopathy is due to birth asphyxia? Am J Dis Child 1991;145:1325-31. Collea JV, Chein C, Quilligan EJ. The randomized management of term frank breech presentation: A study of 208 cases. Am J Obstet Gynecol 1980;137:235-44. Gimovsky ML, Wallace RL, Schifrin BS, Paul RH. Randomized management of the nonfrank breech presentation at term: A preliminary report. Am J Obstet Gynecol 1983;146:34-40. Christian SS, Brady K, Read JA, Kopelman JN. Vaginal breech delivery: A five-year prospective evaluation of a protocol using computed tomographic pelvimetry. Am J Obstet Gynecol 1990;163:848-55. Fajar JK. The β fibrinogen gene G-455A polymorphism in Asian subjects with coronary heart disease: A meta analysis. Egypt J Med Hum Genet 2017;18:19-28. Fajar JK. The association of ectonucleotide pyrophosphatase/phosphodiesterase 1 (ENPP1) K121Q gene polymorphism with the risk of type 2 diabetes mellitus in European, American, and African populations: A meta-analysis. J Health Sci 2016;6:76-86. Fajar JK, Azharuddin A. The association of interleukin 6-174 G/C gene polymorphism with the risk of osteoporosis: A meta analysis. J Taibah Univ Med Sci 2016. [In press]. Gifford DS, Morton SC, Fiske M, Kahn K. A meta-analysis of infant outcomes after breech delivery. Obstet Gynecol 1995;85:1047-54. Berhan Y, Haileamlak A. The risks of planned vaginal breech delivery versus planned caesarean section for term breech birth: A meta-analysis including observational studies. BJOG 2016;1233:49-57. Mozurkewich EL, Hutton EK. Elective repeat cesarean delivery versus trial of labor: A meta-analysis of the literature from 1989 to 1999. Am J Obstet Gynecol 2000;183:1187-97.